Four Fountains Spa is a chain of wellness spas across India that specialise in holistic therapies, tailored to benefit your well-being. 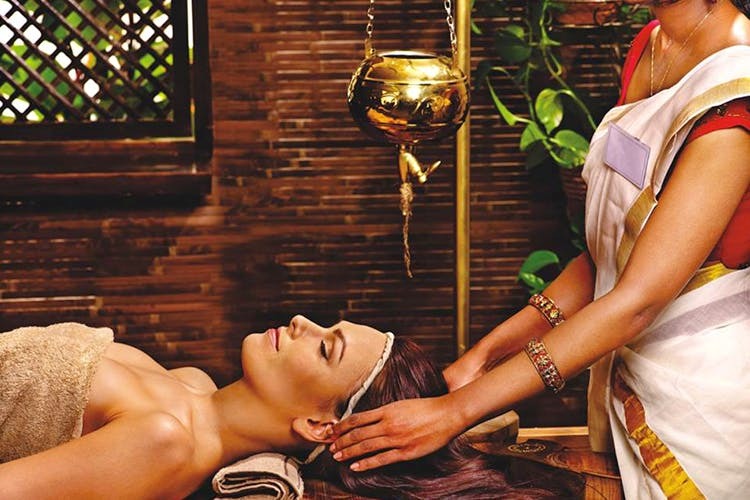 They are present in Delhi, Gurgaon, Bangalore, Mumbai, and Pune – with around 10 spas in Pune, itself. Through their holistic wellness programmes, Four Fountains uses a “unique combination of therapeutic massages, diet changes and exercise regimens to reduce stress-related problems”. The services offered at their Pune spas include therapies for pain relief, better sleep, anxiety relief, anti-fatigue, immunity booster, de-tox, skin whitening, and age reversal. Choose from various types of massages (Swedish, Aromatherapy, Thai, Ayurvedic), to facials, body polishes, body wraps, Shirodhara (an ancient Ayurvedic therapy) – or sign up for one of their curated ‘spa packages’ that cater specifically to different types of stress that prevail in everyday urban life. Some of the spa packages on their roster are a ‘frequent fliers’ package, ‘working professionals’ package, ‘car commuters’ package, ‘ladies sojourn’ package, ‘beautiful bride’, ‘glorious groom’ and couples’ packages. We’re fans of their Aromatherapy massage (which we think is super-relaxing), and appreciate that they thoroughly train all their therapists at their in-house spa training academy. If you tend to visit the spa at least once a week (if not more frequently), you can also sign up for their membership plan. Through this pre-paid plan, you’ll make an up-front payment that will reflect as credit in your membership account (and on your membership card). You can use your membership card to pay for your therapies, at a discounted rate. Bonus points: the membership card can be shared among your family members, and also be used at any of Four Fountains’ spas across the country. There are three kinds of membership plans – with each being valid for a period of up to one year, and can be replenished once your account balance is all used up. For more details on their membership plans, check out their website here. Four Fountains Spa allows you to book your therapies online (through their website), over the phone, or in person. Currently, they’re running a 25% discount for all online bookings, valid until June 30 (2018). Gift cards are also available in denominations from INR 500 to INR 10,000 – which we think are a great option for treating your loved ones to some proper R&R (rest and relaxation). Therapies and offers may be restricted to certain locations, so we advise you to check directly with the Spa at the time of booking. Four Fountains has introduced a special ‘Summer Splash’ massage for the season – using extracts of mint and lime in aloe vera gel. This treatment is meant to cool down your body from the heat, improve blood circulation, moisturise, and reduce skin darkening. We think it sounds like the perfect remedy to this scorching summer heat – so ask for it, when making your next appointment.